Now you can dial up whatever shade of white you want – warm, cool, or anything in between – with American DJ’s new Flat Par CWWW9 and Flat Par CWWW18 LED par cans. Featuring both warm white and cool white LEDs, these two high-output professional pars can produce variable color temperatures from 3400°K to 7400°K, allowing you to create tones of white ranging from a warm tungsten glow to the whitest shade of pale. Not only do the Flat Par CWWW9 and Flat Par CWWW18 produce any shade of white imaginable, they also feature a unique “sit-flat” design that gives them the versatility to be used many different ways: as overhead stage lighting, uplighting, or even inside truss as a truss toner. Housed in a very low-profile case, both models include dual hanging brackets and have their power and DMX connectors positioned on the side of the unit rather than the rear – an American DJ design innovation! This intelligent side-placement design, along with the unit’s level horizontal shape, allows it to sit flat on the ground, making it ideal for uplighting walls and objects, and to fit easily inside truss without brackets. The Flat Par CWWW9 and Flat Par CWWW18 can also be hung from a light bar or trussing easily and securely with the included bracket and safety hook on the rear panel. Great for theatrical productions, concerts, mobile entertainers, displays, and permanent installations, the Flat Par CWWW9 and Flat Par CWWW18 emit very little heat, thanks to their cool-running LED lamps. They are also very energy-efficient and maintenance-free. Their long-life LEDs will run for 50,000 hours without burning out. The Flat Par CWWW9 features 9 x 3-watt LEDs (4x Cool White and 5 x Warm White). It draws just 30 watts of power at maximum use. Both the Flat Par CWWW9 and Flat Par CWWW18 feature a 40° beam angle, built-in Color Macros, a Strobe Effect, 0-100% Dimming, and smooth color mixing with fast or slow color change operation. Each unit can be run 6 operational modes: DMX-512 Mode; Color Dimmer Mode; White Presets Mode; Color Fade Mode; Sound Active Mode; and Auto Run Mode. When used with a DMX controller, there are 3 different channel modes to choose from: 3, 4, or 5-channel. A convenient 4-button display on the rear panel gives users easy access to DMX settings. The Flat Par CWWW9 and Flat Par CWWW18 can also be run wirelessly using American DJ’s optional LED RC infrared remote controller (sold separately). 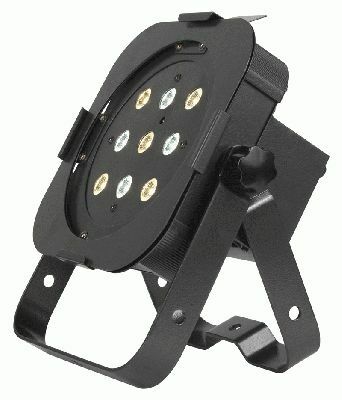 The fixtures can be operated remotely from up to 15 ft./4.5M with the LED RC. Other features include IEC AC IN/OUT outlets to daisy chain power, and multi-voltage operation: AC 90V-120V, 50/60Hz. The Flat Par CWWW9 and Flat Par CWWW18 also come equipped with a gel frame for optional diffusion filters. The Flat Par CWWW9 measures 10.75”L x 9”W x 4.25”H/ 272 x 230 x 105mm, and weighs 7 lbs./2.8 kg. It has an MSRP of $279.95. The Flat Par CWWW18 measures 13”L x 11”W x 4.25”H/ 328 x 280 x 105mm, and weighs 8 lbs./3.2 kg. It has an MSRP of $379.95. Protect the Flat Par CWWW9 or Flat Par CWWW18 during transport and storage with the Arriba Cases AC-117 gig bag – it’s a perfect fit!